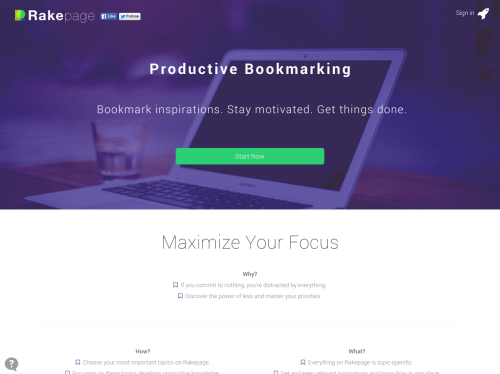 Rakepage is a website for productive bookmarking. Get things done based on your bookmarks. Set reminders for your bookmarks so you don't forget to get back to them. Easy and structured organization of your bookmarks. Read news from your bookmarked blogs and subreddits in one place. Rakepage combines different aspects around bookmarking to create a unique new experience how to get more productive with bookmarks. Instead of just collecting (hoarding) bookmarks, the bookmarks are combined with reminders so you will not forget to get back. A pre-defined structure helps you to keep the bookmarks easily organized and at the same time you contribute to crowd-sourced, social bookmarking to build an awesome knowledge platform based on your daily habits on the web.